We are leading Manufacturer and supplier of Premium Quality Low pressure Air Separation Plants, Oxygen Plants and Nitrogen Plants of all sizes ranging from 20 m3/hour to 500 m3/hour including Cryogenic Tonnage Oxygen plants, Cryogenic Tonnage Nitrogen Plants, Air Separation Plants and Liquid Oxygen Nitrogen Plants. The company has entered into technical collaboration with ING. L. A. Boschi of Italy. 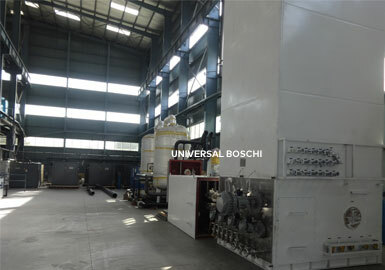 Quality: UNIVERSAL BOSCHI is a certified ISO 9008:2015 organization and it has also got CE certification that assures our customers of world-class quality of our products. A. Oxygen Purity gas 99.7% at 150-160 Bar (2200PSIG) or upto 200/300 bar as required for oxygen cylinder filling . B. high purity Nitrogen 99.99 %( 3ppm optional) or cylinder filling. NOTE : There is no loss of oxygen production when producing high purity nitrogen. A few of the latest technological features incorporated into the Oxygen & Nitrogen plants are listed below. Purity of Oxygen produced from all plants is minimum 99.7% and Nitrogen Purity CAN BE available up to 1-3 PPM (Depending upon requirement of the customer). All plants use "Oil free" rotary screw /centrifugal oil compressor working between 5-7 BAR. All plants incorporate Aluminum Brazed exchangers and packed columns for high efficiency. Turbo expanders (GAS Bearing) for trouble free operation. 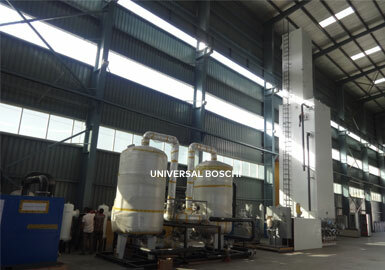 Engineering support along with complete quality control is provided by our company. We provide qualified engineers for Supervision, Installation and start up of all our plants as well as training of manpower at customers’ site. Very low power consumption with proven performance and virtually Zero maintenance required for the machines. Air is compressed at a very pressure of 5-7 bar (kg/cm2). Air can be compressed at such low pressure by trouble free rotary air compressor. The second stage of the process uses a low pressure refrigerant for pre-cooling the processed air to temperature around 12 deg C before it enters the purifier. The air enters a purifier consisting of twin Molecular Sieve driers, working alternatively. The Molecular Sieves remove the Carbon dioxide & moisture from the processed air before the air enters Air Separation Unit. Oil free, moisture free and Carbon Dioxide free air enters into low pressure fin type HEAT EXCHANGER where the air is cooled below sub zero temperatures by air expansion process in the turbo expander. Air gets liquefied when it enters the air separation column & gets separated into oxygen & nitrogen by the process of rectification. Oxygen is available at the outlet of the ASU at a purity of 99.6%. Nitrogen is also available t the outlet as a second product at purity of 99.9% upto 3ppm simultaneously without loss of oxygen product. the final product in the form compressed Oxygen/Nitrogen goes to the high pressure oxygen cylinders at 150 bar or upto higher as required. 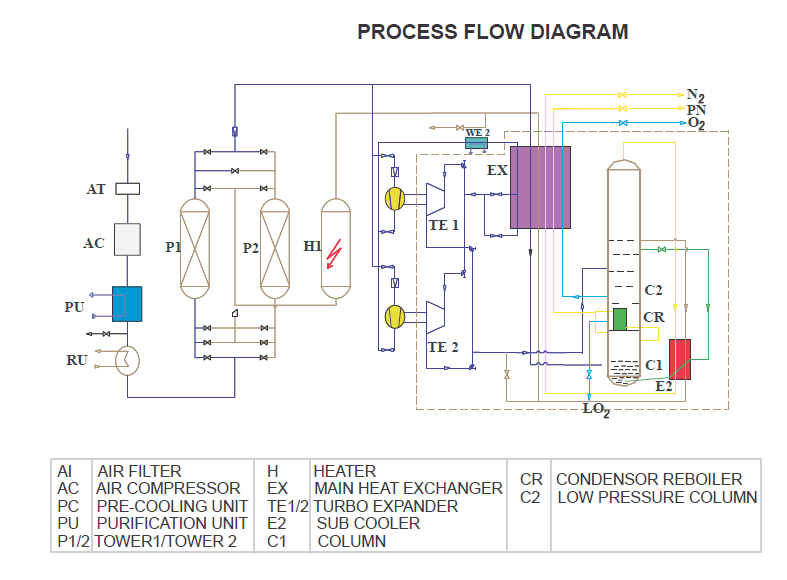 This can be done by liquid oxygen pump is same models. We can use oil & water free compressor. Argon is recovered ABOVE 1000M3/Hour Oxygen Plants by a revolutionary technique employing full rectification without using the Hydrogen and De-Oxo unit thus saving further on power costs, operational costs and investment. This makes the Boschi design machines highly versatile and economical thanks to all the research and development done over the years. Note: Check USA & Germany manufacturers for technology comparison. Cryogenic Expander : The Cryogenic expander is a gas bearing expansion refrigeration turbine that is much more efficient than any other expansion device. Test bed for 100% reliability and tested at 150,000 rpm at minus 190 degree centigrade.Trouble free service for years!